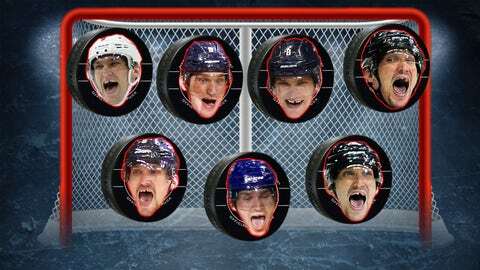 The many faces of Alex Ovechkin: Half the fun of watching him score is seeing his reaction. Watch out, National Hockey League: Alexander Ovechkin is back. Just a few games past the halfway point of the 2013-14 season, the Capitals “sniper” already has 34 goals and is leading the league in scoring. Why “sniper” in quotes? We’ll get to that in a second. First, please enjoy FOX Sports’ plotting chart of every goal the NHL All-Star has scored this season. It’ll give you an idea of where Alex is converting from. All those Ovechkin heads cluttered in tight to the left of the net? That’s one hotspots in particular teams should deny him from ever entering. Every goal Alex Ovechkin has scored in the 2013-14 season as of January 18. Ovechkin isn’t there yet, but consider this: The last time “The Great 8” scored 50 goals was 2009-10 (of course, that span includes a shortened year as a result of the most recent lockout). And while pacing has its drawbacks for predicting total stats, right now he’s on track for 60. His most recent tear comes on the heels of two “subpar” seasons (by Ovechkin standards) in which the right winger recorded 38 and 32 goals in the previous two full schedules. As he struggled to find his scoring touch, one question that was raised was whether the league might have adapted to his game. Had pro defensemen learned how to eliminate him off the rush, no longer falling for his fancy isolation moves? And it turns out last year’s performance was only a preview of what the hockey world has witnessed through the first half of 2013-14. Through 46 contests, Ovechkin has two more goals than he scored in last year’s 48-game slate. Well, that’s just the thing: Ovechkin is scoring every which way this year. Yes, he’s using his slap shot. And, yes, he occasionally scores off the rush — and seeing the skillful Russian in full flight is still a sight to see. But what’s more impressive is the variety of ways he’s sticking the puck to the back of the net. Forehand? Check. Backhand? Yup. Deflection? Да (That’s Russian for “yes,” by the way.) Off the faceoff, on the fly, on the empty net? Yes, yes, and yes. But that doesn’t mean there aren’t a few patterns, too. No surprise, Alex loves the left side. He’s a righty who’s fond of hanging out on the off-wing, which will give any shooter a much better angle than playing on his natural side. And as you can tell from the diagram above, about 75 percent of his tallies come from the left half of the ice. But for a closer look at the wide variety of his goal-scoring repertoire, here are some videos that show how he’s getting the job done. Ovie might be using other skills to diversify his goal scoring, but he hasn’t lost his wicked slap shot. Ovechkin’s not above picking up trash in front of the net, though. Lose a draw, and it’s in the back of your net. Assist: Nicklas Backstrom. Yep, he’s still got it. He’s only had one goal in this fashion in 2013-14, but this move to the backhand is a dandy. Just for good measure, here’s one into a yawning cage. Ovie getting a piece of a shot from D John Carlson. San Jose, anyone? Why not go top shelf, too?